I am lucky to live in a town that has farms surrounding it, some are less than ten minutes away. 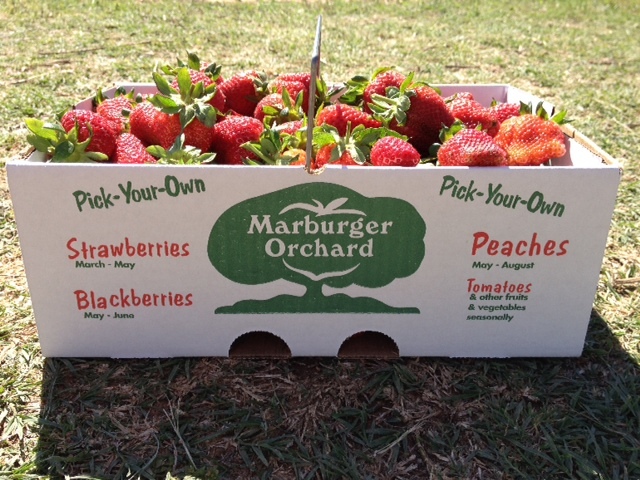 Not only can we get fresh produce regularly, but when in season, we can go pick our own peaches or berries. The weather has been absolutely beautiful lately and on Friday, so my dad and I went early to Marburger Orchard to pick strawberries. When you arrive, you get a quick overview of the right way to pick strawberries. Basically, never pull on the plant to get the strawberry, you pinch it off, which results in green fingers and fingernails. So, remember that the manicure should come after this! You also want the berry fully red, except for the tip opposite the stem, which can be a little green. You are allowed one sample or "taster"during the overview, but are not supposed to eat while you are picking. We ended up picking two boxes worth at about $2.75 per pound. In May and June, the blackberry bushes will be ready to pick from. We plan to reserve an 8 a.m. spot for the first pick before anyone else has a chance. 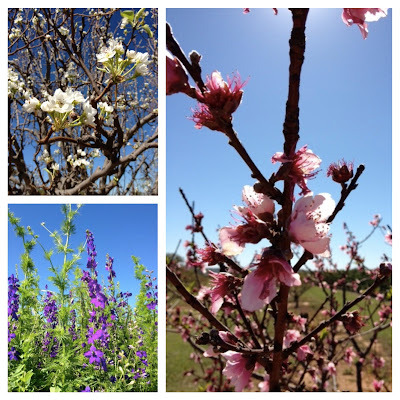 I am also really looking forward to the peach crop, our mild winter has set us up for a great peach season. The colors of the peach trees blooms and other flowers were so beautiful! 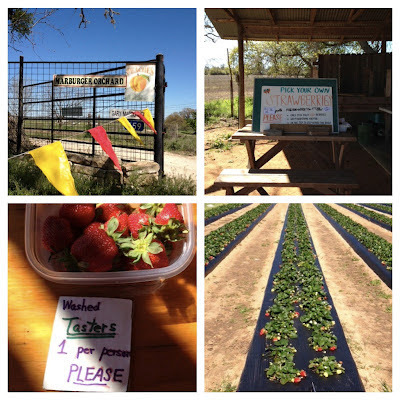 Today we are cleaning and preparing the strawberries to freeze them so we can enjoy them year round. I will be putting together a quick DIY on that for tomorrow!